Heat-generating plants are used in industry and in heating technology. The safe operation of such plants requires a large number of safety devices. They are designed to prevent, among other things, excess temperature, overpressure and vacuum. In the area of temperature monitoring, in addition to a large number of other instruments, safety temperature limiters are used. 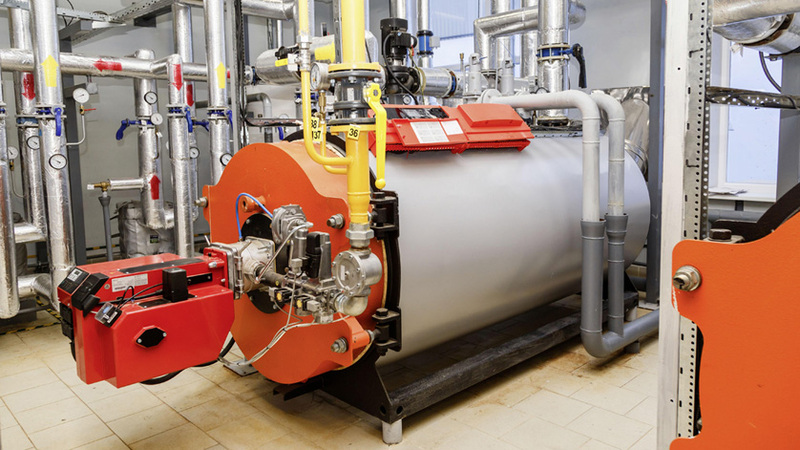 For the operation of heating plants, it is customary to use a combination of several closed-loop and open-loop control units. A safety temperature limiter is used as the “last instance”. Connected upstream are typically safety temperature monitors, temperature controllers and thermostats. The function of a safety temperature limiter is to switch the plant to a fail-safe state when overheating occurs, i.e. when the established limit temperature is reached. When this fault occurs, the safety temperature limiter must be unlocked by hand. This is to guarantee that the plant is checked and the fault, if present, is eliminated, before the plant is switched back to its normal operation. This switching characteristics for safety temperature limiters is prescribed in standard DIN EN 14597 for use of safety devices in heating plants. Another essential aspect of standard DIN EN 14597 is the time response used by closed-loop and open-loop control units to enable safe operation of plants. It must be guaranteed that these instruments perform their control or switching functions within established time parameters, after an established limit temperature has been exceeded. Moreover, based on this standard, a notified body can certify, via an EC-type examination, that these instruments fulfil the directive 2014/64/EU (Pressure Equipment Directive). The safety temperature limiter SB15 from WIKA uses an electric design and is equipped with a mechanical temperature system. The temperature is detected by the liquid expansion principle. The closed measuring system with liquid filling consists of a temperature sensor, a capillary and a Bourdon tube. The change in pressure produced as a result of the heat applied to the temperature sensor in the closed system is transmitted through the capillary to the Bourdon tube and then displayed on the dial via the angular deflection of the pointer shaft. The shifting disk, which is arranged on the pointer shaft, actuates the switching operation at the micro switch when reaching the non-adjustable switch point or in case of measuring line breakage and locks the current status. A reset is only possible, after the scale value drops below the set switch point by approx. 3% of the scale range. Safety temperature limiters when used as safety devices contribute considerably to safe operation of heat-generating plants. Their use in heat-generating plants is regulated by standard DIN EN 14597. Further information on the SB15 safety temperature limiter can also be found on the WIKA website.